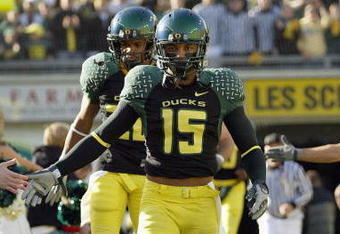 Sometimes the best entertainment about our Ducks can come from scrimmages of the past. This report below was written on April 22nd of 2005, when Dennis Dixon was just a Redshirt Freshman and Kellen Clemens was going into his senior season. The interesting perspective that time gives us! Long before FishDuck.com existed, there were FishDuck scrimmage reports. When spring came around, if the Ducks were practicing I’d do my best to document it all. These reports would get passed around various Oregon websites to much fanfare, the fervor over these was largely the motivation behind starting this website. 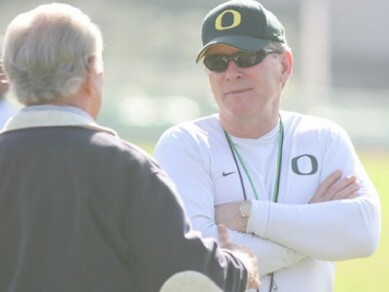 However, as we all know Oregon decided to close all practices for the foreseeable future. Oh sure, the Ducks are practicing, but outside of the team and coaches who the heck knows what is actually taking place??? It doesn’t stop anybody from writing about spring practices as we all need our football fix, but it’s all speculation until the spring game. So keeping that in mind we at FishDuck.com are having a little fun…if they won’t let us watch current practices, instead we’ll use the benefit of hindsight and have a laugh or two over some of my past scrimmage reports. The last two scrimmages reminded me of the stock market this past week; one day awful, and the next day coming back strong and determined. In the big picture, I have seen enormous improvement in the new offense from the first scrimmage to now. Naturally, when Ngata sits out a scrimmage (like this one) the running game picks up, but that only affects the 1st unit while the 2nd and 3rd improved proportionately as well. What a difference on offense from the first scrimmage; things are so much crisper with the QBs making excellent reads, hence the defense was stuck several times in very difficult positions. Do they pursue quickly? If so, then the hole they vacated will have a tailback zipping past behind them on the counter-action. If they stay too long in that spot to defend the aforementioned play, then their pursuit to the other side of the field will be late when chasing and option to the wide side. A dilemma created by running this offense well! I found that it IS an option play…when in a shotgun the QB puts the ball in the breadbasket of the tailback that was lining up on the QBs left. The RB is crossing in front, (left to right) and the QB is reading what the defender is doing. If he’s charging outside to help with the impending double option (between the QB and a receiver circling from behind) then, the QB leaves it in the tailback’s belly and he’s off running at full steam ACROSS THE DEFENSIVE GRAIN. This play got TONS of yardage today, and the defense was clearly getting irritated. What do you do? You can’t defend it all, and just ONE breakdown that is recognized by the QB…and it costs the defense big-time. Think that might be why they went to this offense? Something we HAVE to get used to is taking a five yard loss much more often then we’re used to seeing, because the next play could be for 12 and you’re looking at 3rd and short with a defense that is a little off-kilter. It happened often…a 3-7 yard loss on a stuffed option followed by a big option outside, or a nasty inside pitch for 13 yards. The snaps from center to QB in the shotgun went well with only one muff…big improvement, and the receivers seemed to get more open today. As you can tell…I’m highly amused with the “counter-option”, but I’m still flabbergasted seeing the QB take off outside…doing a TRIPLE OPTION! Whitehead had just one block on an outside pitch and rocketed down the sideline, cut inside a defender and kept his momentum forward for a nice gain. The concept of an inside pitch still “blows my mind”, but it was a devastating weapon when executed correctly. That was the problem…my problem, as I hadn’t seen it performed LIKE THIS before. We got a bunch of big chunks from this play because, again, the defense can’t cover them all! The TD by the 1st team using this play had me shaking my head and left stunned expressions on a few fans around me as well. Clemens is in the shotgun, takes the snap and takes off to the left. The defense realizes what is coming down and charges up the LOS and you see a mass of green and white uniforms that are blurred with the speed that they run. I thought this play was DOA after three steps but was astonished to see Clemens step up to the defenders, and as they converged on him and Whitehead….he hit ‘Spoon with the crispest, fastest inside pitch I’ve ever seen. It HAD to be perfect among the defenders, because if it was—then it was an easy TD. (Which is what happened) Wow. What a read and pitch by Clemens. If I played defense…that would torque me off as well. They had the play figured out—they thought. Demetrius Williams and Justin Phinisee did a little trash-talking to each other…well Justin did most of it. On one play that was overthrown the two were debating what would have happened if it had been closer. Phin says, “it doesn’t matter…you still gotta catch it!” Later, when the offense started on the one yard line, Clemens threw a sweet pass down the sideline to Williams. I was unsure if either player was going to get there in time because of all the hand-fighting and pushing between the two as they ran downfield. But the ball came to Dee’s outside shoulder, and after a little push-off…that was all the room that Williams needed. Phin wasn’t in a debating mood after that 40 yard gain. Overall the receivers showed more smarts today and I liked it when after Filipe was crushing the pocket from the right again…Clemens had to run for anything to the left. Brian Paysinger saw the problem and broke off his route and came back. Kellen hit him; Brian sidestepped his man, and then ran for a first down next to the sticks. Great play. Dennis Dixon was again VERY impressive with his execution and confidence running the offense. One drive was great fun as he took a few five yard losses on options to follow it up with BIG gains on inside option pitches and scrambles of his own. As if the defense hadn’t seen enough of him running outside…he goes back to pass and tucks it in up the middle on a QB draw that was perfectly executed. He almost scored from the 15 yard line. A TD that came about from the 20 yard line was a fade to Jaison Williams that was something to behold. Perfect execution by both parties. Dixon has put on weight, but not enough. He is still quite slight of build and I worry about all those runs he does. Isn’t it hard to throw the ball when you have someone nail you in the arm, tackling you as you went down on the play before? It seems that opposing players lick their chops to get shots at the QB profile that Dixon offers. He still has the SKINNIEST LEGS of ANY football player I’ve ever seen, let alone QB. How he has the calf strength to run that fast…I’ll never know. He’s looking more like Akili every scrimmage with that similar build and speed to match that wrist flick throwing motion that is comparable to Smith as well. He also sounded strong and authoritative with the team at ground level. This guy could be an All-American for us…. On another drive, Dixon had the defense concerned about the options and short passes that when, on 2nd and three he lined up under center…which would suggest a traditional running play? But the Offensive tackles were in a pass block stance to start the play? Then, Dennis stepped back and pumped hard, and then lofted a spiral beauty to Strong in the end zone. I think the defender still has the mousetrap on him as he bit for that cheese. Oh, and BTW…we have been annoyed at the short passes in recent years, but they have one now that, when blocked well by only one or two in support…goes for 8-10 yards more often than not. Interesting play. Did the defense give up more this time? Yes. Did they play poorly? No. You didn’t have wide open holes for running lanes or open zones with players untouched. The defense made the offense DESERVE whatever they got, and it started with the first series as the pocket crumpled from Philipe’s side and drove Kellen to run out to the right outside, but Sanders shucked his man and didn’t just tackle Clemens…he drove through him and took Kellen from running to flying backwards and landing flat on the ground. It all happened so fast! Fun stuff. I noticed that Jackie Bates and Patrick Chung were playing some 1st team defense and the closing speed of Jackie is amazing. On a botched play we saw Finley end up with the ball tearing around left end and Bates sped up and THWACKED him into the turf and rolling out of bounds. Now you know Bates isn’t big, but that was a knocker with velocity. Right in front of me had Witherspoon doing a crossing pattern coming toward me and Brady spotted him and delivered a tight pass coming into the numbers. It has to be an excellent pass because Jerome Boyd was right on him…and it was superbly thrown, but Boyd dove in front to knock it down and prevent a 12-15 yard gain. Nice “D”. 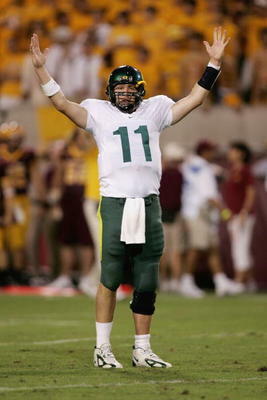 Matt Toeaina had the “D” play of the day as Clemens planted to throw, and then pumped, and then in a split second as he pulled it back you saw a green wave engulf him and strip the ball. Big turnover deep and a unique strength/athletic play for Matt; it’s great to see him getting his confidence! Speaking of confidence…what has Victor Filipe been eating lately? His pass rush was VERY disruptive and frequently drew a double team on the pass rush, hence opened things up for his teammates. He got Clemens on one nice sack, but repeatedly was so strong on the bull rush that he COLLAPSED the pocket into Kellen, thus now he can’t throw, but run for his life! The play’s timing was busted, and it all started with the penetration into the offensive backfield by Filipe. New starters are making big steps forward…we love it! The Special Teams still have some problems…serious ones. We had an extra point blocked and two of them MISSED by Luke Bellotti, and then LB missed a 25 yard field goal as well. Center snaps were still high, but not as bad as the other day, in fact barely noticeable. The punt formation makes me nervous and TimL was commenting how it made him uncomfortable, and not two seconds later we saw a punt blocked from this formation and nearly run back for a touchdown. When we had some impressive punts…then we had the punt fumbled on the catch! However there were many good things in improvement from last time. Both punters hit some deep ones; Knowles hit one between 50-55 yards, and Dragich hit TWO of them. One of those really cut through the air in a spinning spiral. On Kickoffs, we saw Martinez kick it three yards deep in the end zone in the extreme right corner which was a very effective kick. After hearing about my stupendous memory from a couple of posters…I got worried about what I WAS forgetting, so for the first time I utilized the Dictaphone option on my cell phone. Not good for long descriptions, but ideal for short bursts to remind me of a play, hence MORE reporting than before. What a deal. Oh how we love our Spring Ducks!